When a friend of the Mertzes, Eddie Grant, stops by for an unexpected visit and finds they are not at home, he leaves a message for them with Lucy. When she learns that the lingerie salesman is an eligible bachelor, she immediately begins brewing plans to fix him up with her girl friend, Sylvia Collins. The plan backfires and, through a clever montage of misunderstandings, Lucy and Ethel wind up in Eddie's hotel room, wearing some very skimpy negligees. The girls have some tall explaining to do when Ricky and Fred arrive on the scene. Ricky: "Lucy! You here...dressed like that! You must be out of your mind!" Fred: "Ethel! You here...dressed like that! He must be out of his mind!" It's all a big mistake. Eddie was merely trying to show his appreciation for the girls' hospitality by selling them some lingerie wholesale. 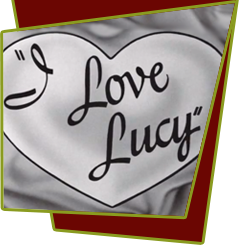 Special Notes: This episode is based on lucy's radio show, My Favorite Husband, Episode #107, "Trying to Marry Off Peggy Martin".